I received a new cookbook in the mail last week, and I couldn't be happier. I've been looking for American Vegan Kitchen since it came out earlier this year. I haven't been able to find it in my neck of the woods. Even the Great and Powerful Powell's, in Portland, was sold out. I've been thumbing through it's pages and, so far, I like what I see. 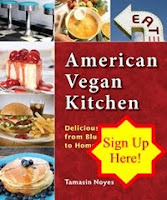 And, I'll be giving away a copy this month for VeganMofo. If you'd like a chance to give away a copy of American Vegan Kitchen, just comment on this post or, any time this month, comment on the Our Veggie Kitchen Facebook Page. I'd love to win to win over my recalcitrant son. He won't eat anything vegan except my beer chile and cornbread! ooh, i'd love a copy! I've been meaning to get a copy of that book for months now. I'm really curious about the American cuisine! Happy MoFo! I have *almost* bought that book a few times now, but my budget conscious has gotten the best of me. Happy Mofoing! I'd love to win a copy of this cookbook! Cool! I've been seeing this cookbook pop up on lots of blogs, so I'm really curious. count me in for the running of the cookbook! I don't own a single vegan or veg cookbook, can you believe that?! This would be an awesome addition! Can't have enough vegan cookbooks! I don't have this one, and I'd love to cook from it! What a fun giveaway -- I LOVE cookbooks. I would love to win a new vegan cookbook!! Thanks for doing this contest, Mofo! That would be wonderful. I'm just starting to build a recipe cabinet and this would definitely be a nice addition. Thanks for hosting! I have several vegetarian cookbooks, but no vegan ones. Thanks for doing this giveaway! Ohhh my first vegan cookbook! I too would love to win this giveaway. I've tried the Incrediburgers and there were delicious. I think I would love the style of her recipes and would be thrilled to have a copy. I've heard great things about this book and would love a copy! I've been searching for this book for ages! None of my local bookstores are carrying it, no matter how much I beg :( I would love to own it!! Definitely excited about the prospect of winning a copy of this one!! I'd love a copy of Tamasin's book! I definitely need a copy of that cookbook! It looks fascinating. I have really been wanting a copy! Thanks for all of the great recipes you share with the rest of us! I'd love to win this cookbook! Awesome giveaway, I'd like to win this for my sister! I can't get enough of vegan cookbooks! i could use some vegan ispiration! Yes! I'd totally love to win this cookbook! i really want that cookbook! her blog is awesome! i'd love to win this cookbooks, i've heard nothing but good things about it! I've heard such great things about that cookbook! (vegan) comfort food is the greatest food! Yay! This one is on my wish list. I'd love to win! Thank you!!! I'd love to win! This is my birthday month (the 21st) AND I am a new vegan. Thanks! I'd love to win a new cookbook! oooh! i have been eying this book for some time now! your blog is wonderful and i have bookmarked so many of your recipes! thanks! I haven't seen your blog before, but I am glad Tami linked to you because I see a couple of recipes I need to try. I have heard such great things about this book and would love a copy. I would love to win it looks amazing! I'd love to win--I've heard good things about this book. Fingers crossed! I bought a copy of this book for someone as a gift, but would love to win a copy for myself! I love the recipes in this book! I'd love to win! I only have one vegan cookbook so far! Vegan cooking/eating is made easy with a cookbook like this. Would love to win it. Thanks for the chance. I'd love to win this cookbook. I've had my eyes on it for awhile. I'd love to win a cope of American Vegan Kitchen. I've heard great things about it and I absolutely love comfort food! I have been eying that book for a while... I would love to win a copy! Just like everyone else here, I'd love to win a copy! I'd love to try this one! I need inspiration in the kitchen! A new cookbook would be awesome. My vegan-specific cookbook collection is sadly lacking. I usually just modify mainstream stuff. I'd love a copy of this. Yum-a-licious! I want to win!!! I would love love love a copy of this cookbook; it's awesome! I'd love to win this book, it looks awesome! 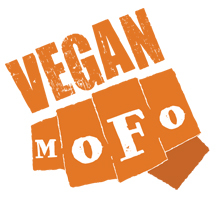 Again, another great contest from Vegan MoFo! Hope I win, but congrats to whoever does! looks like an amazing cookbook! I'd love to win !!!! Looks like a great book, I'd love a copy of it! Sounds great - I would love a copy of this cookbook! I'm newly vegan, and really enjoying the learning curve! I would like to add to my two vegan cookbooks, both by isa! I'm American, Vegan, and I have access to a kitchen so I'd probably be into this book. I would love to have this cookbook! !Thank you for the opportunity! ooh, this can help me make tasty american vegan meals for my non-veg husband.